Our family had gathered to celebrate my father-in-law’s birthday when we were distracted by the drama unfolding in the sky. 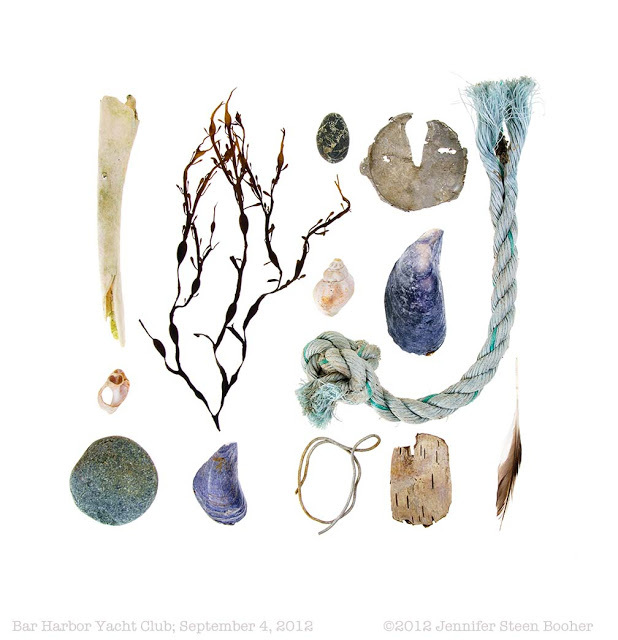 First a fragment of rainbow began to spring upward from Ironbound Island. Then a second rainbow shot off at a funny angle. 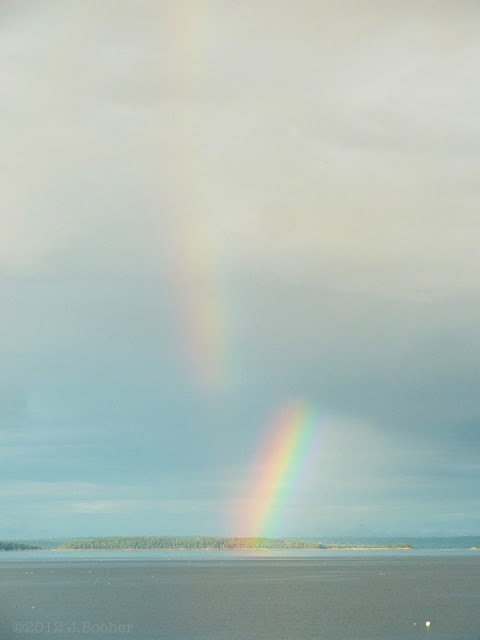 It was a reflection rainbow, a very rare phenomenon that occurs when the sunlight forming a primary rainbow reflects off a very large and still body of water. All rainbows are full circles (cones, really) of which we only see a portion. 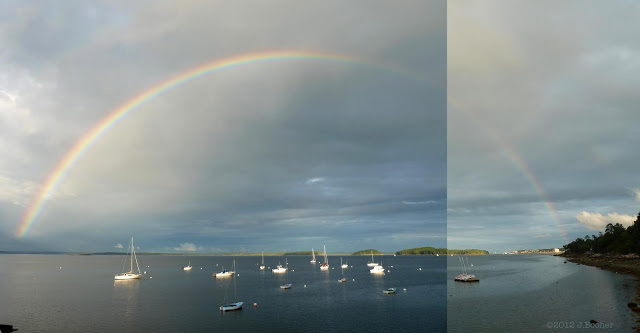 The center of a reflection rainbow is above the horizon, whereas the primary rainbow’s center is below it, which is why that arc is at such an unexpected angle. The base of the arch was so crisp we could see the point where it ‘touched’ the water. It looks so physical that it’s hard to comprehend the optical effect that’s happening. Did you know that because rainbows are an optical effect, they only exist in our own eyes, and no two people truly see the same rainbow? It isn’t like fog, which is a physical thing. If there were no viewers, there would be no rainbow. Contemplating the physics of rainbows is my personal Twilight Zone. Try to imagine the giant cone of light refracting through the raindrops and concentrating itself on your pupil. Always makes me blink. 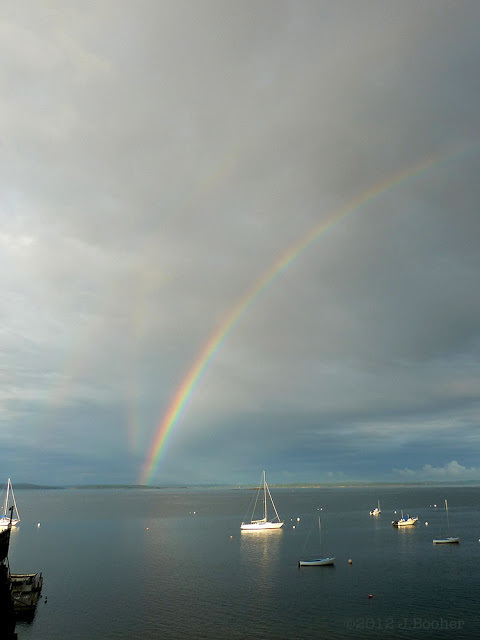 The primary rainbow kept growing, and a classic double rainbow appeared, except we already had the reflection rainbow, so it was a triple show. 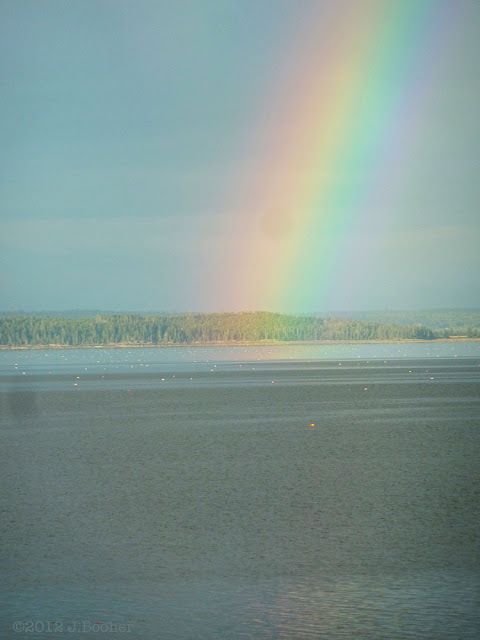 After half an hour or so, the rainbow spanned the whole bay. The other end touched down somewhere near town. Talk about good omens – I think my father-in-law is in for a very special year!